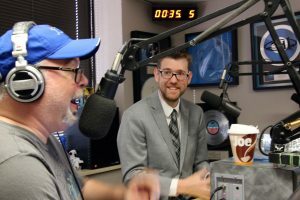 Tulsa attorney James Wirth joined Josh and Chuck on the Morning Edge again on Sept. 20, 2018 to answer questions about medical marijuana, child support, protective orders and vehicle searches during traffic stops. Josh said he is having a great time — to which of course Chuck agreed — and asked James Wirth to return every Thursday. We anticipated curve balls. Last week the Morning Edge duo came up with the crazy idea that they could be private investigators for the law office. They would call their side venture “Josh and the Fat Man,” Josh said, alluding to private eyes in television drama. James Wirth dryly offered to see if any clients wanted to try out the radio guys’ proposed PI services. Playing along, he spared them details of licensing requirements that would be involved. Yet Josh took the dry offer as a snub and explained as much to his sideman. Tune in every Thursday at 9 a.m. for Make Law Easy™ on The Morning Edge with Josh and Chuck. If you have a legal question you need answered immediately, call Wirth Law Office today for a free, private consultation. Get the information you need to make the right decision about your legal matter. To begin your no-cost, no-obligation consultation, call the Wirth Law Office Tulsa attorneys at (918) 879-1681 or send your question using the form at the top of this page.